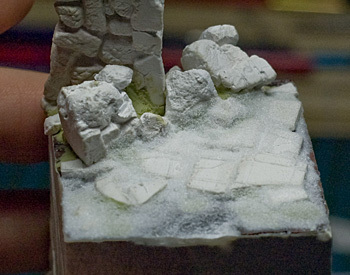 In this tutorial i'll show you how to build a desert styled base for a 70mm Miniature. 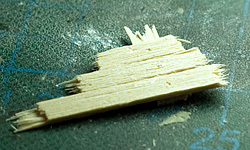 The shown techniques could be also used for bases for smaller miniatures. Many of the tools can be replaced by something similar, be creative, be McGyver! As you maybe guessed from reading this list this will be a rather long tutorial, so better go and grab a banana before reading this! We start by setting a theme for the base, i wanted to have a desert themed base with sand on the ground, covering some destroyed tile floor and a broken door frame with the size of a pillar. 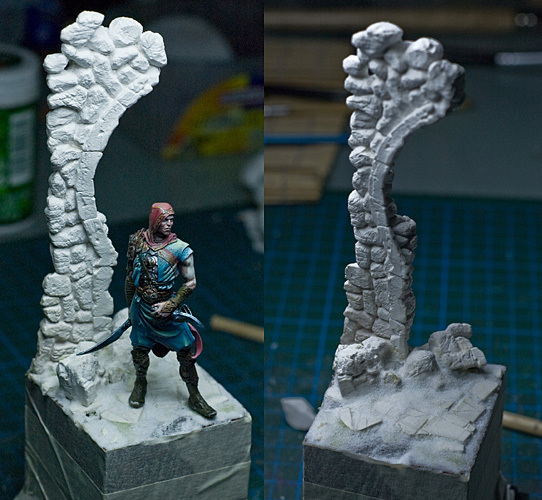 After trying out different methods to create the pillar (almost needless to say they all failed me... haha) i wanted to give the so called 'gypsum carving' a chance. I read about it on another tutorial and wanted to try it out for quite a long time. So i ordered some dental gypsum on ebay and the result was exactly what i searched for. First we have to create a mold for the gypsum. Let's think about what kind of door we want to create.... if you like to you can sketch it first. I started by sketching the design on a piece of styrodur. After that i cut into the lines with a hobby knife. With the screwdriver i poked out the inside leaving dents and holes in the form. A flathead screwdriver is best for this. Now we're ready to pour the gypsum. 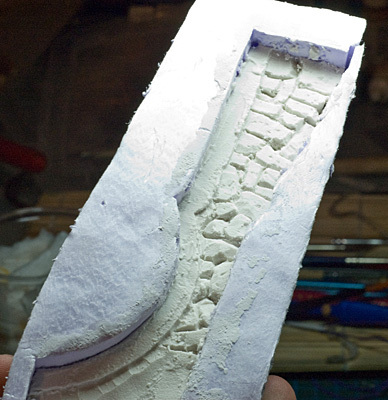 Mix your gypsum like it's written in the manual and pour it into the mold. bad, the water will set itself apart while drying. Pour a little bit of the gypsum into the lid of some plastic box or something similar so you have a thin layer of gypsum when it's dry. Now you have to wait a little bit. Good time to write some comments on massive voodoo or to eat a banana! 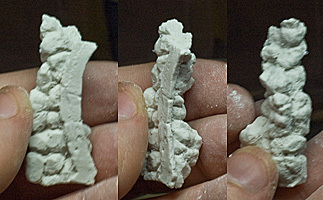 When you notice the gypsum get's hard (time depends on gypsum type....) you can start carving. The importand thing is that the gypsum still needa to be pretty damp, better try start working on it sooner than later. 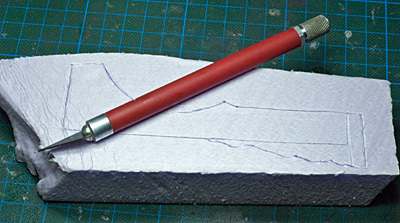 I started carving when the gypsum was still pretty damp so i could carve the rough shapes pretty smoothely with my Zahle A tool. I began with the door border and progressed through the stones. 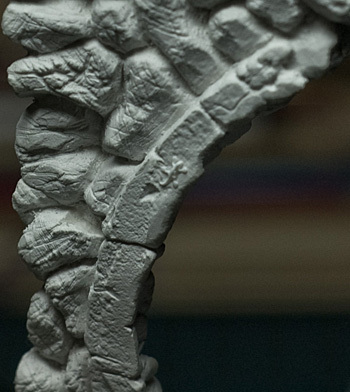 Try carving the biggest details and shapes first. Then i further detailed the spaces between the stones. 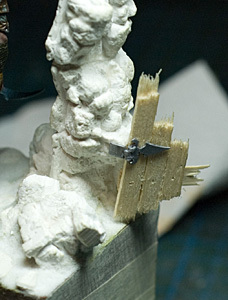 You'll notice how the gypsum gets dryer and harder as you progress with the carving. This comes in handy as it hold detail better as dryer as it gets. At this stage the gypsum won't hold that much detail, save that for later. Continue detailling and when you think you're done (don't try to overdo it at this stage ... Too much detail and it won't look believable). Now we need to create the back and the sides of the wall. As you have guessed, you need to remove the mold. I did so by cutting into the sides of the mold and just broke it apart. While doing this, i broke my wall into 3 pieces. Nothing to worry about as wehave our trusted super glue!! I started defining the lines between the stones with my Zahle A tool as i did in the front and i removed the 'mold lines' on the decorative border. After that i defined the shape of the deco border on the side. I wanted it to look as it were different stones that have been put on there. Here are the 3 parts so far. After doing the side, i created some seams between the stones on the back. 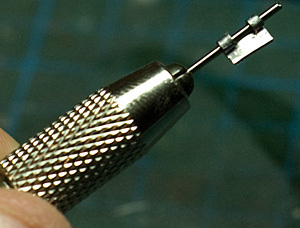 the screwdriver poking in the styrodur. 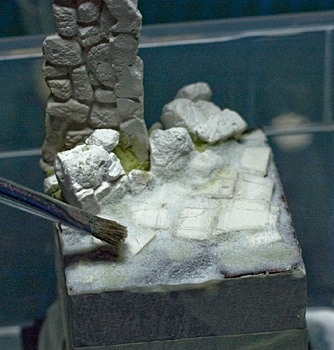 When i was so far done on the back side, the gypsum was pretty hard and i could continue with detail work. For this i used my needle tool. I carved out more of the space between the stones, added dents and damage to the stones and some cracks into the decorative border. After this stage the gypsum was ready for the final detail. For this i used a self made tool consisting of basically 2 wires bent over at the tip. With this tool i scratched around on the surface in different random directions. interesting and helps very much sometimes! When the wall was finally dried on the next morning, i glued it together and put it on the base to think about the composition when i noticed that i made it a bit too tall. 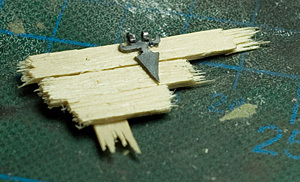 Buuuut this was no problem, i just cut off a little piece which i could use as broken wall segments on the base. After i was confident with the composition i took a piece of the gypsum plate we poured in the beginning which was already dry. 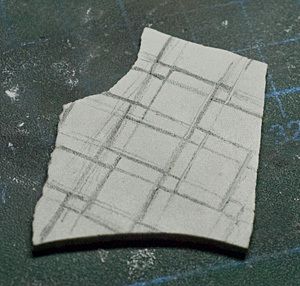 I broke of a piece of it with the right size and drew some lines on it (a basic raster). Then i looked in google image search for an interesting pattern of a tiled floor. 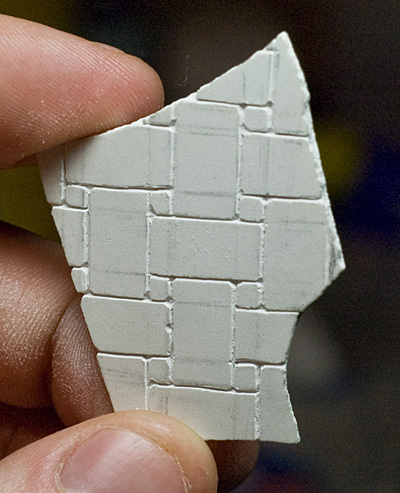 When i found a pattern i liked that wasn't too complicated i drew the pattern on the gypsum piece. 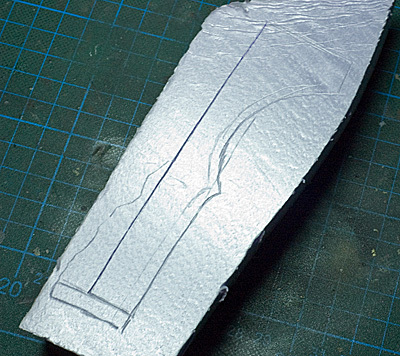 Again with the Zahle tool i started carving out the basic lines. This should be done pretty fast. 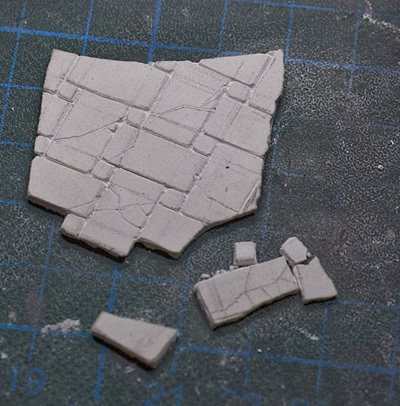 After the carving was done, i broke some of the tiles. With the wall and floor done we can start putting the stuff on the base. I used a socket from sockelmacher.de for this. Before i did anything on this wonderful piece, i taped the sides of the socket so the beautiful wood doesn't get painted. I forgot to take some step by step pictures here but i basically put some Milliput on the base and started by pressing the wall into it. Then i reinforced the sides a bit with more Milliput and created the basic shape for the sand dunes that should be there later. 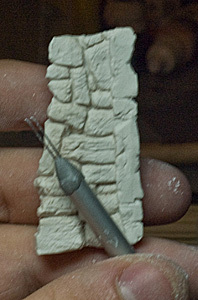 I put a thin layer of Milliput beneath the wall which was a little bit thicker in the middle than on the sides. You then need to put a little water on the Milliput to keep it wet, otherwise the gypsum we're about to add won't hold. Now i pressed the floor peice onto the milliput, my plan worked like i thought and the floor tiles broke at the carved lines creating a destroyed tile floor. 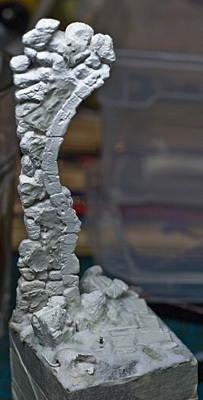 After that done i added the pieces of broken wall onto the base. Just use some Milliput and press them on the base. I then defined the basic shape of the sand dunes with the rest of the milliput. too much detail or spread out everything too much. So we finished the biggest part of the base. Now we will add the sand. Because sand is very fine, especially desert sand i won't use normal basing sand as i nromally do. Instead i decided to give baking soda a try. 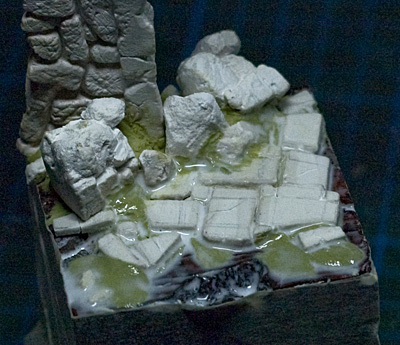 To make it look like it flowed into the crevices between the tiles etc we will use dilluted PVA glue to fix it on the base. 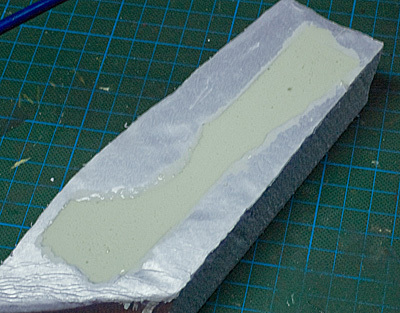 Get a small container and put in some PVA glue and a bit of water (around 60 percent glue) and mix it. 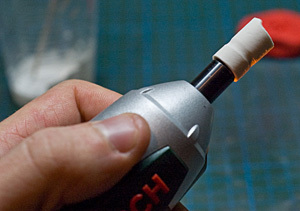 Then use a old paint brush to put the glue on the base. Do this in 3 or 4 segments so the glue won't dry before you could add the baking soda. 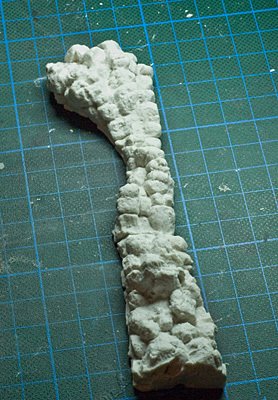 Here i added PVA glue to one of the 'segments' of the base. Ready to add backing soda. Put the base into the container and pour the baking soda over it. Shake off the excess and continue this for every segment of the base. After the baking soda is on the base, take a bristle brush and wipe off the baking soda from the tiles and from everywhere were you don't like it (less is maybe more here). 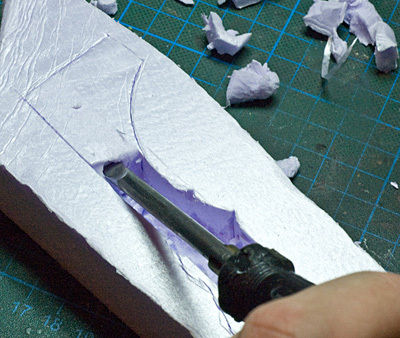 Do this when the glue is not already completely dry but not soaking wet. Wipe away the sand from the tiles. If you don't do this step you'll lose many details. 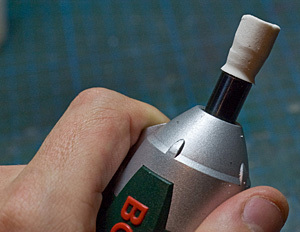 While the glue is drying, press onto the baking soda with your dry finger to make a smoother surface. 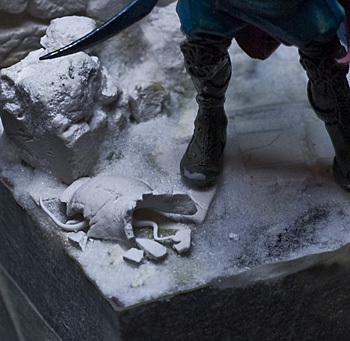 Here's a photo with the miniature(WiP) fixed to the base after this step. Ok, now it gets a little complicated... I've tried several methods for creating such a vase. Gypsum carving did it again for me. I have to say, i could have done this a lot easier because i destroyed the vase anyway after finishing it, but i want to show you a method here. 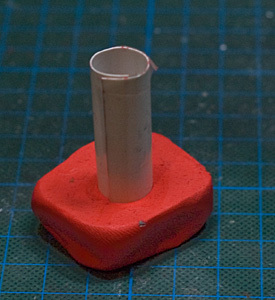 Take a piece of thin plasticard and tape it to a round shape. (brush, pen, anything..) and tape it together. The next step is a bit of McGyvering. Because i don't own a drilling machine i had to improvise. 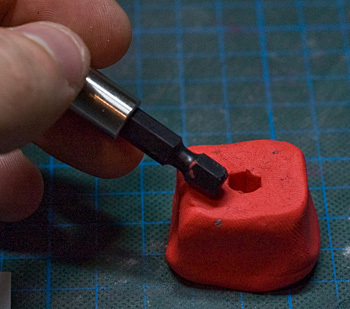 I used the bit of my electric screwdriver and pressed the positive end into a block of clay. 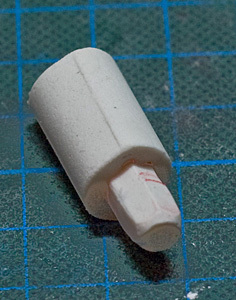 After that i pressed the cylinder of plasticard into the clay. Add some plutonium and your flux-compensator is done! If you like to (it'll really help!) you can now press a small wire into the clay in the middle of the 'screwdriver hole' so it'll support the whole thing a bit. 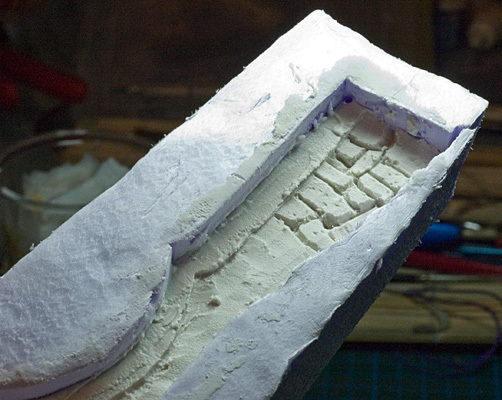 Now mix some gypsum and pour it into this mold. 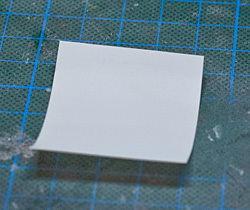 After almost dry, remove the clay and cut the tape on the plasticard to get this wonderful piece. The big plus of the electric screwdriver is that it won't rotate that fast so i have total control and the gypsum wont break that fast. I took a hobby knife and started carving the piece while it rotates in the tool. It really works... i'm amazed. I had to try this 2 times until it worked. Continue until you have a rough vase. out while it's on the tool. Now i finished the vase by making everything round by further carving with the hobby knife. I also carved a bit of the inside away so it looks hollow. After looking how it adds to the base i decided to destroy the vase and hollow the inside out completely (pretty easy one you have two halves). I sawed the vase into two halves and broke some pieces off, added dents and scratches and finally glued it onto the base. I decided to add a little detail to the base. First a snake in the vase and a small salamander on the wall. other 'big companys' for the rest of your life! 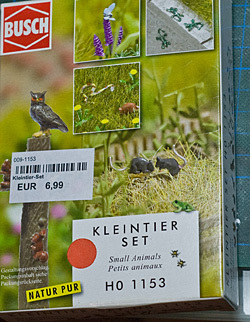 The quality of this set is AMAZING, there are all kinds of animals that are super small without mold lines.... So i'm not telling you to buy this, but believe me you won't regret these 7 euros. Here is the salamander glued to the wall. And the snake in the vase. I wanted some grout on the wall. i used this stuff for it, normally you fill holes in the walls in your appartement. book shelf, you need this stuff!!! I put some of this stuff on a small piece of paper, added a little bit of water and put it on the wall in some random pattern. Try to not make the patches too similar. Let's start with the broken door. 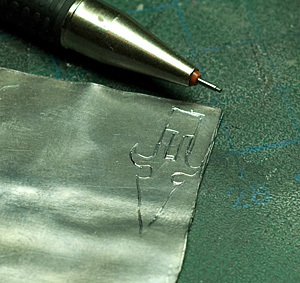 Take a piece of lead foil. You can also use plasticard or what ever you have at your hands that'll fit here. When i start to scratchbuild thing, before i do anything i do a quick sketch of what i want to do. With this sketch it's easier for me to think about the materials i want to use etc. otherwise it's hard to cut. Take something round and roll over the lead foil to make it flat. Hey you idiot! That's NOT FLAT! 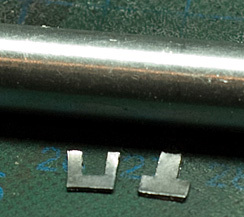 Bend the ends around a piece of wire or something similar to make them round. and continue with the second part to finish of the door pivot. 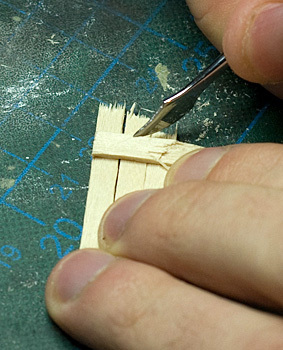 Now cut and break the wooden pieces to a desired shape and glue them together. 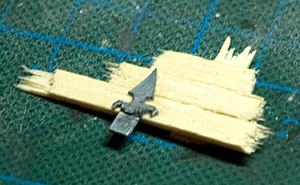 You can add a little wooden structure with a sharp tool but that's optional. it's a great tool for all kind of detailling. Punch in some holes with something sharp to create 'nails'. would be overkill in my opinion. Now glue the first part of the pivot onto the wood. Search for the best position before glueing it into place. 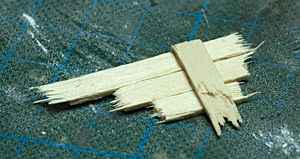 And position and fix the second part with glue. into it if you want a stable connection. Glue the broken door to the wall and you're done. So far for the first part of this Tutorial. In some days i'll post the second part: Painting and finishing the base. I hope you maybe got some inspiration from this article. Raffa your a sick littel guy... No seriouy awsome tutorial. Very good and presisly explained. Can't wait to see it painted. Wow there are many cool tricks youve shown here! I have to trie some of them! Crazy guy ;) Cool stuff! a great Tut from a great artist. Thanks for this. Thanks a lot, that is really all useful information. 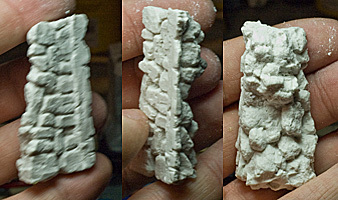 I will give the styrodur mold for the gypsum a try. That looks pretty simple and fast :-) Many, many thanks for sharing. None the less I wanna thank you for this wonderful tutorial. Great inspiration to me! Baking salt as desert sand? That's brilliant! Keep up the great work mate! 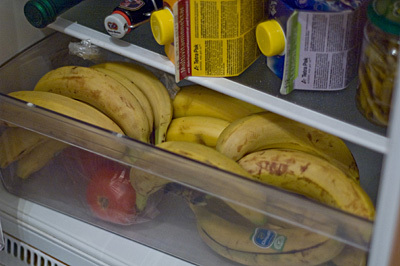 Thanks for the great and detailed tutorial, but I'm shocked that you have anything else than B&B (Bananas and Beer) in your refrigerator :D.
"I'm Chiquita banana and I've come to say - Bananas have to ripen in a certain way- When they are fleck'd with brown and have a golden hue - Bananas taste the best and are best for you - You can put them in a salad - You can put them in a pie-aye - Any way you want to eat them - It's impossible to beat them - But, bananas like the climate of the very, very tropical equator - So you should never put bananas in the refrigerator." Just Lovely work.. 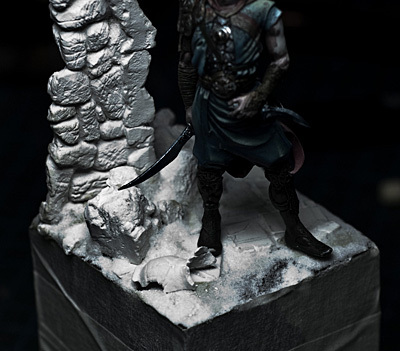 I would of loved to mold and cast that for my line at Dragonforge. Nice work! I've just come across your Blog and am finding loads to keep me interested. Many thanks for this nice tutorial. By the way, could you give some adress where I could order gipsum? in france, or at least in europe?